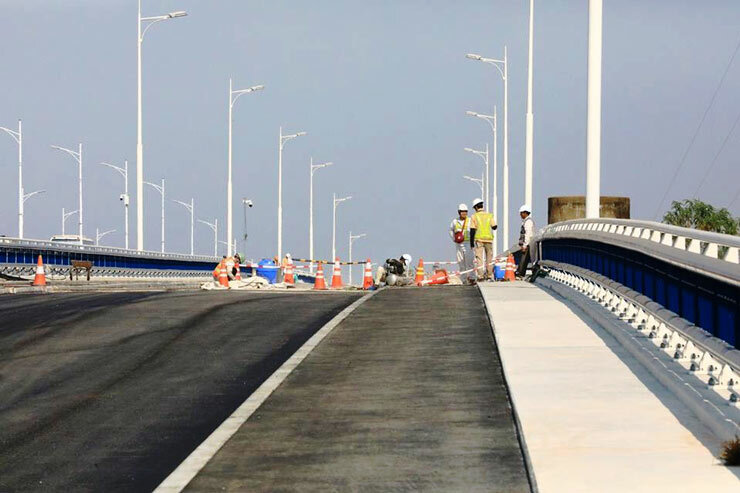 The first Chroy Changvar Bridge, more commonly known as the Cambodian-Japanese Friendship Bridge) will be temporarily opened for Khmer New Year in mid-April. The Ministry of Public Works and Transport announced on its Facebook page on Friday (Feb 1) that the repairs on the Cambodia-Japan Friendship Bridge, which began in September 2017, are now 93 percent finished. The reconstruction project should to be completed on June 14, 2019. Because the bridge’s repairs have progressed faster than expected, the ministry decided that it can be used to ease traffic flow during Khmer New Year. In March 2016 the Japanese government granted funds for the reconstruction of the bridge, which suffered cracks from 12 years of usage. The rehabilitation project, guided by Central Consultant Inc. and carried out by the Obayashi Corporation (both Tokyo-based), began late 2017. Japan allotted $181 million to renovate National Road 5 (Phnom Penh to Poipet), rehabilitate the Chroy Changvar Bridge, and support the Cambodian Mine Action Center’s demining operations; about $33 million were for the bridge. The bridge was built in 1966, suffered serious damage during the civil war in the 1970s, and collapsed in 1972. It was later rebuilt with Japanese aid and recommissioned by the Cambodian government in 1995.